Take your home entertainment experience to the next level with an Elite UHD TV. Combining style with must-have innovation, it’s made to deliver a spellbinding TV performance, capturing a greater range of vibrant colours as well as life-like brightness. Packed with every leading-edge feature from Wide Colour Gamut and HDR to pin-point sharp UHD picture clarity, this surprisingly affordable TV Series brings you plenty of access to compatible HDR content. As well as supporting HDR10, the Elite UHD model offers compatibility with Dolby Vision HDR content – the preferred HDR format of world-leading movie makers. A home entertainment hero, the TV’s future-proof visual and audio technologies are framed by an ultra-slim and contemporary metal design. Industry leading multichannel codec for surround sound comes with Finlux. Delivers immersive surround sound from a 2.0 speaker configuration commonly used in TVs. Features definition control for maximum high frequency realism and clarity. Control your smart TV and go beyond the mobile experience with Finlux Smart Center. Smart remote embedded application, that can connect social media accounts, allows peeking in program details via rich EPG services. Clones free DVB broadcast channels on your mobile device with Follow TV. Watch your multimedia content in mobile device on TV with DLNA support. Touchpad support for Internet browser experience on Smart TV also comes with voice command availability. Dolby Vision is Dolby's particular HDR version that requires special Dolby Vision approved hardware and compatible content. Metadata that accompanies Dolby Vision video signal carries information about the original content. It shows astonishing highlights, deeper darks, and colors never seen before on TV. Great dynamic range of luminosity is achieved by capturing and then combining several different exposures. 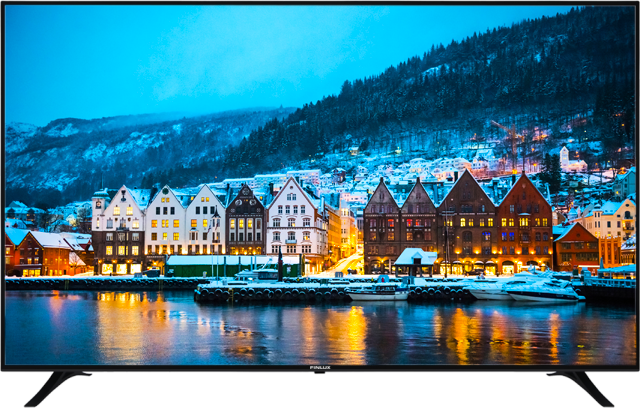 UHD TV’s are now delivering the visual experience to the living room with more contrast. Detail and crisp images create an experience that brings you into the story. Special LED usage to increase color gamut of the TV. Better green and better red are available that satisfies more than 90% DCI compared to standard TV’s 76%. More lifelike and more colorful pictures achieved. Innovative design, superior technology, premium quality, eco friendly. © 2017, FINLUX, Inc. All Rights Reserved.